'Flying godwit' photo © Rebecca Bowater Published with kind permission. Purchase the book 'Shorebirds of the Motueka Sandpit and Estuary' through the contact information to Friends of the Motueka Estuaries at the top of this page. Price is $20 for one copy or $35 for two copies. Godwit Blessing 2018...we are working on putting something together! Check back in a week or two. For details of past blessings please see the photos below. 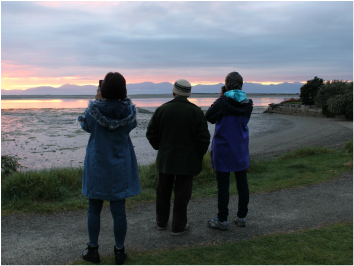 Friday 30th September 2016 a crowd of around 70 people gathered early morning at the Old Wharf Motueka to welcome the godwits back to our shores. The rain held off and we had a stunning blessing led by Kaumatua Rore Stafford. The timing was perfect. Around 1/3 of the birds flew back from Alaska last Monday after their epic, longest nonstop migratory flight of any bird in the world. The blessing was described by those attending as ‘magical’, and as the sun arose over the sandbank the godwits were welcomed with Karakia from members of Te Ātiawa, Ngati Rarua (and associated groups). 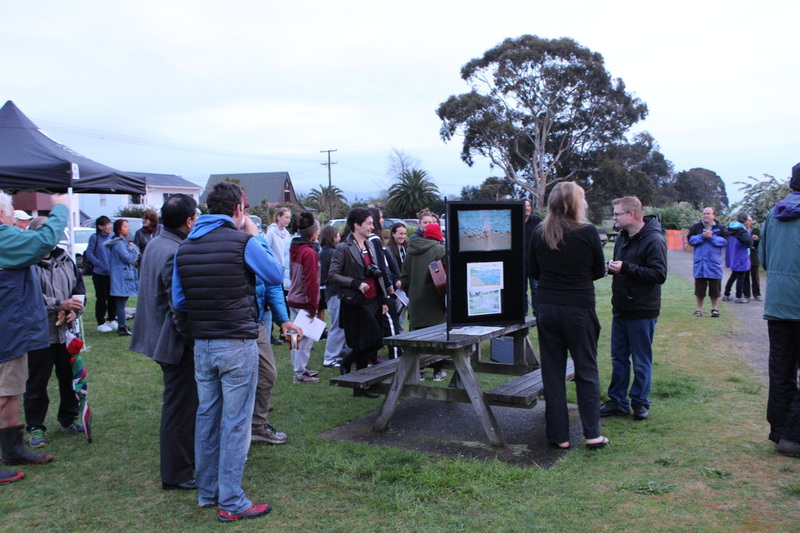 Members of Birding NZ were there with their telescopes and DOC supported the event with a speech about the birds and their habitat. Afterwards people were treated with hot soup and rolls provided by DOC to start off the morning. 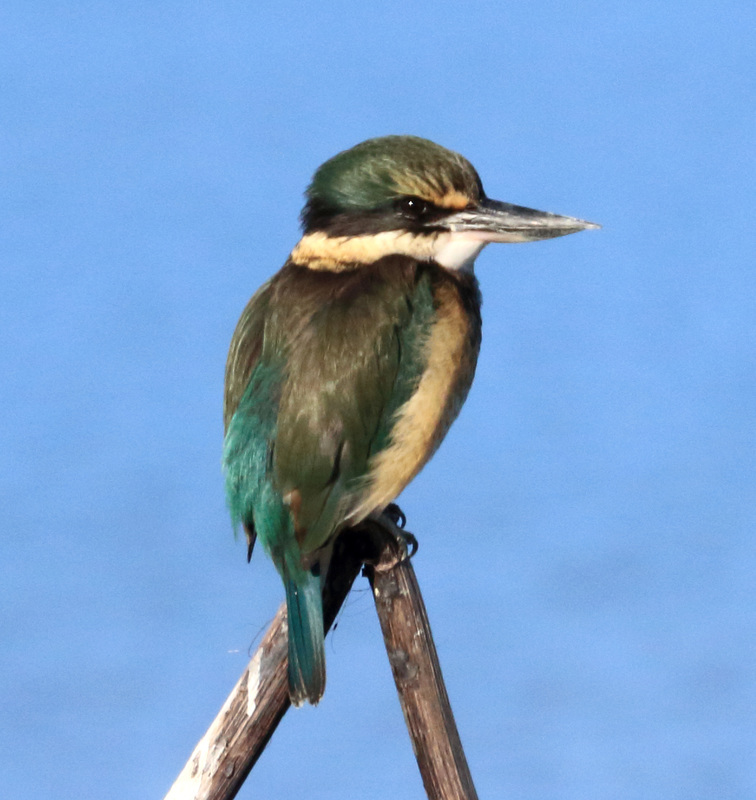 ​Friends of Motueka Estuaries had a stunning display on the birds of our shoreline. 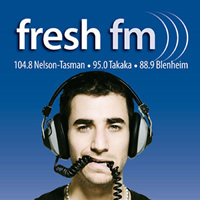 Start off your Monday with Richard Hicks and guests, live from Fresh FM 's Nelson Studio. Monday mornings 7-9. Monday 12th September (7.40am) includes an interview about the godwit festival and the importance of the Motueka sandbank with Friends of the Estuary spokesperson Dana Wensley. ​Click on this link to listen to the podcast of the show. 'Sacred Kingfisher' © Rebecca Bowater. Published with permission. 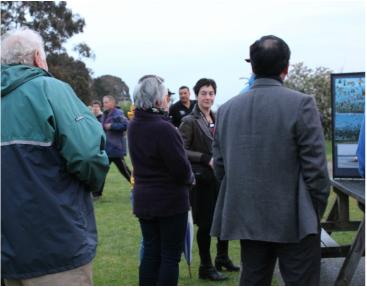 Friends of Motueka Estuaries are pleased to have the support of Rebecca Bowater. She has supplied us with the extraordinary photo that now graces our website. Rebecca is a Nelson photographer and has supported Friends of Motueka Estuaries and its events for many years. We will be publishing more of Rebecca's photos throughout the year in the lead-up to the godwit welcome in September. ​Rebecca Bowater has seriously been photographing nature since the year 2000 in NZ and Overseas. Through her passion of NZ alpine flowers, fungi and birds Rebecca has received many awards and has her photographs produced in several books and on the website ‘nzbirdsonline’. She received her Fellowship with the Photographic Society of NZ in 2006, has received gold, silver and bronze medals. In 2013 she received an international photography award. You can find out more about Rebecca and follow her photographic adventures on her website here. Graphic © North American Bird Conservation Initiative. ​Since 1992, one billion birds have disappeared from North America. One-third of all North American birds in need of urgent conservation action. The report, prepared by the North American Bird Conservation Initiative can be downloaded here. The importance of protecting mudflats and wetlands as feeding grounds for our migratory birds is highlighted in a report on National Radio (17th November). Lou Sanson, Director-General of the Department of Conservation, explains how with support of iwi, science, DOC, international groups (ranging from China, NZ, and Russia), the 7 km stretch of land that is a crucial feeding ground of the Red Knot is being protected. Surrounded by large industry, the peninsula that is a feeding ground for the red knot is highly fertile. ‘Our birds are programmed to land on the 7 km coast...’ he said. It is joint efforts like this that are necessary to preserve these breeding grounds. Godwits belong to the Charadriformes group. It is a shorebird that lives along New Zealand’s coastline. The Māori name for godwit is the kuaka. Godwits lay their nests in Alaska. Godwits have the longest migratory flight of any bird on record. Flying 11,000km across the Pacific. They arrive in the Motueka Estuaries in September, and feed here over the summer before heading north again in March. Just prior to landing a flock may split apart. On landing they often can be seen running together with excited chattering. Some immature godwits winter over in New Zealand. Males are around 30cm, with a bill of 85 mm and weigh around 300g. Females can be 41 cm, with a slightly larger bill of 105 mm, and weigh 350g. The godwit's call sounds like a ‘tuu-tuu’ in roosting flocks. Godwits are gregarious. They feed in flocks, fly in flocks, and roost in large tight flocks. Shorebirds use their bills to search for food. The bill is made for probing in the sand and mud for food, mainly marine worms found in the estuaries and molluscs. Their beak has special sensors called Herbst’s corpuscles that detect pressure changes, allowing them to find buried prey easily. The fine for killing a godwit carries a maximum penalty of $10,000. In the Northern hemisphere summer, the ground may be hard still from a permafrost. Godwits eat insects such as two-winged flies during their time in the Arctic tundra. After they arrive in the Motueka Estuary the first thing they do is rest. Godwits lay a single clutch of eggs (around four) in a scrape of ground in the scrub or rocks. Their plumage provides some camouflage against predators (especially skuas). Due to the short stay in the Arctic tundra, there is no time for a second brood. It is crucially important for the species that the first chicks survive. To raise awareness of the unique biodiversity of the sandspit, and what we can do to minimise harm to the shorebirds, each year the Department of Conservation hosts a Dog's Breakfast at the beginning of the sandspit. Timed to coincide with the arrival of the godwits, it is a unique opportunity for dog owners and walkers to meet members of DOC, and to learn how they can use the sandspit in a way that does not cause damage or stress to the birds who make it their home. There is much we can do to protect their habitat. The Motueka Estuary is home to a range of sea and shore birds. All these birds demand our attention and protection. Each month the website will highlight a bird that lives in and around the estuary. October we are highlighting the Banded Dotterel. The Motueka sandspit is fast becoming the primary breeding ground in the region for the Banded Dotterel. “These birds breed only in New Zealand and make their nests as a scrape in the sand. From October to February they nest along the length of the sandspit. The Banded Dotterel is a small bird, often first heard by a high pitched ‘pip, pip’ before it is seen running and bobbing along the sand. It can be recognized in the breeding season by the two bands on its chest, a thinner black band under the chin and a wider chestnut band across the front of its chest. The eggs are well camouflaged and can easily be inadvertently destroyed by people. Dogs, or horses walking along the top of the spit. From Pauline Samways, “Birds of the Motueka Spit and Estuary” [funded by a grant from the Royal Society Science, Mathematics and Technology Fellowship 2003]. Published by Tasman Bays Heritage Trust, Nelson Provisional Museum (2003). We are pleased to have Fay Bolt join our group. Local author and birdwatcher, Fay came to Motueka more than 36 years ago and for most of that time was Head of Music at Motueka High School. When she retired from teaching in 2010, she and her husband Derek published her first book, The Bird Garden with images and anecdotes about the birds in their Orinoco garden. Derek and Fay have now ‘down-sized’ to a small townhouse in Motueka and Fay continues to photograph and write about birds. 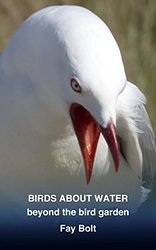 Her recent ebook, Birds about Water: Beyond the Bird Garden features many of the water birds found on the Motueka Estuary and in Golden Bay. It is a beautiful book with stunning words and illustrations. In memory of Pauline Samways who devoted her time, energy, wisdom, and enthusiasm to the godwits. Motueka has a special role in protecting the godwits. The godwits arrive in spring each year from Alaska and spend six months on our sandbank feeding and getting ready for their great migration to their breeding grounds in Alaska. The sandspit at Motueka is the second in significance for the godwits in the region. It provides a home each year to between 2,000- 3,000 godwits. This is second only to farewell Spit which hosts around 11,000. Will you fly or bide? The godwits fly to the Motueka sandspit each year from Alaska. It is the longest, nonstop migratory flight of any bird. They are part of Motueka's unique ecological and cultural heritage, arriving in spring, shortly before the flock of tourists. Motueka sandspit is a unique ecological and internationally recognised site. It is at risk of damage if we do not take steps to protect it and the unique shorebirds that make their homes in the sand. The godwits symbolise the act of migration. According to Maori, the first explorer to reach New Zealand was Kupe. Using the stars and ocean currents as his navigational guides, he ventured across the Pacific on his waka hourua (voyaging canoe) from his ancestral Polynesian homeland of Hawaiki. In 1642 Abel Tasman chartered NZ for the Dutch East India Company, and he was followed by Captain James Cook and other European explorers which brought a second wave of migration from the Northern Hemisphere to this small island in the Pacific Ocean the Maori named Aotearoa (the land of the long white cloud). We are all here because of a journey. Whether made by our ancestors, or ourselves. The godwits remind us that migration, departures, and arrivals are a natural part of life. We should rejoice in these events, and remember not the sadness of farewell, but the happiness of return. Motueka comes together each year to bless this miracle of migration. A miracle that repeats itself year after year, whether we are here to see it or not. This migration connects us with each other, and with those on foreign shores whose hearts and minds the birds touch on their special journey. We are joined with those in other parts of NZ who gather to farewell the godwits, those in Australia who witness their comings and goings as we do. By the godwit's flight, we are also joined with those in Korea where the godwits feed on their journey north, and those communities where the godwits will land, where they build their nests and lay their eggs before their return to us. The godwits remind us of this miracle of friendship, of our connection with others, of our need to connect with ourselves and the environment. We bless the godwits because they bless us with their presence. For a fantastic insight into where our godwits go when they leave the Motueka Estuary have a look at the video presentation by Robert Gill from the U.S. Geological Survey. In association with Cornell Laboratory of Ornithology, it shows the Alaskan tundra where the godwits breed with great shots of chicks and eggs. The film highlights the need for a global perspective on conservation to protect these birds in all their habitats. 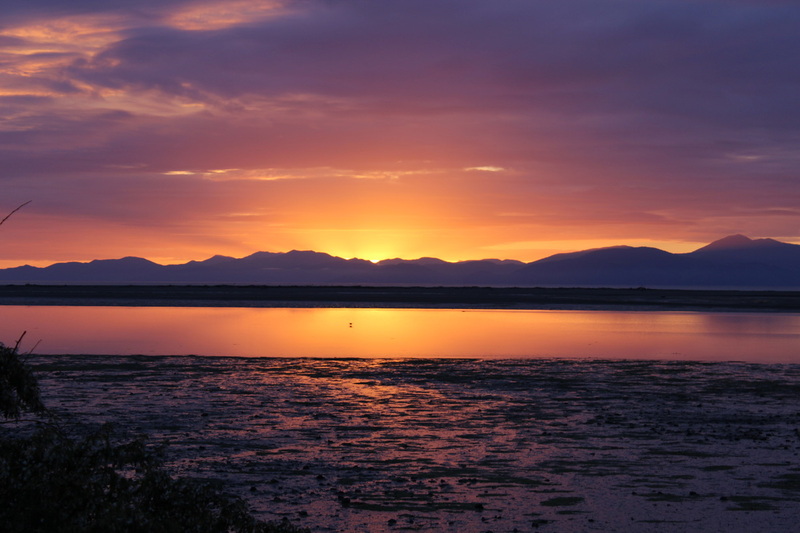 This website is maintained and operated free of charge on behalf of the Friends of Motueka Estuaries by Dana Wensley. Please send comments, suggestions, complaints or updates of information relating to life on the estuary to danawensley@xtra.co.nz.